Inside Texas dropped by Midway High School in Waco to talk with 2009 Texas commit Trey Graham. National champ plays WR for Rowlett and will likely be one of the top receivers in the ’09 class. The Garland Rowlett WR says UT is at the top of his list, but is Texas interested? One of the state’s top ’09 prospects is just a few miles west of the Forty Acres. Lake Travis QB aims for a state championship, but also camps at both UTs. 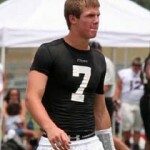 Lake Travis’ Garrett Gilbert holds a Big 12 offer, but has he heard from the Longhorns? A day after Signing Day ’08, Lake Travis QB became Texas commit No. 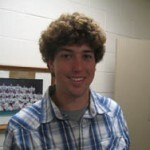 1 for Signing Day ’09. Listen to Gilbert’s entire announcment press conference. IT caught up with ‘Shep’ to get his reaction to Garrett Gilbert’s commitment and more. 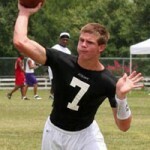 Texas quarterback commit for 2009 Garrett Gilbert underwent surgery on Wednesday for a torn labrum.